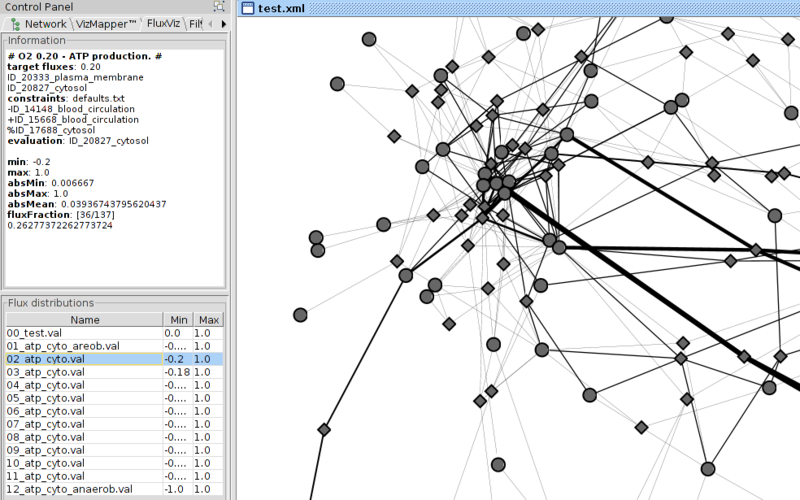 cy2fluxviz is a Cytoscape 2 plugin for the visualization of flux distributions in networks. For Cytoscape 3 use cy3fluxviz. cy2fluxviz was developed by Matthias König within the Virtual Liver Network. CyFluxViz supports the visualization of FBA results from openCOBRA via the Matlab CyFluxVizToolbox. The CyFluxVizToolbox, a collection of Matlab scripts, generating the CyFluxViz files from the COBRA FBA solutions. CyFluxViz allows the visualization of tracer experiments. Figure 2: CyFluxViz visualization of flux distribution in human hepatocyte network. The ATP production was set as target flux under varying oxygen conditions. For the layout a standard Cytoscape Layout algorithm was used. CyFluxViz Panel on the left with information about the selected flux distribution and selection area for the loaded flux distributions. 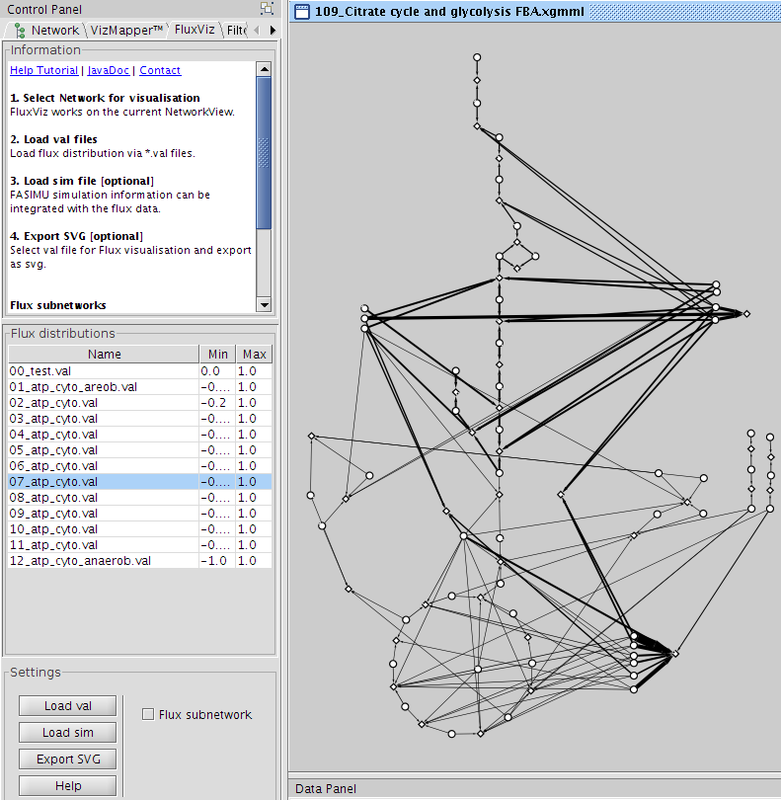 Figure 3: CyFluxViz visualization of FBA simulation in reconstructed hepatocyte network. Metabolic network consists of glycolysis, gluconeogenesis, pentose phosphate pathway and citrate cycle. Identical network to Figure 1, but different layout algorithm. Manual generated layout was used for the visualisation. On the left the CyFluxViz Control Panel with help dialogue, flux distribution list and settings panel. The cyfluxviz functionality is accessed via the cyfluxviz Panel located in the Cytoscape Control Panel after clicking the CyFluxViz icon in the Cytoscape toolbar . The Information Area is used for the visualisation of help information or information about the selected flux distribution. By clicking the 'help button' the help menu is loaded in the Information Area. In the example on the left additional information for the flux distribution '03_atp_cyto.val' is displayed in the Information Area. The Flux Distribution Area displays the loaded Flux distributions and is mainly used for the selection of the flux distribution for visualisation and image export. Network for the visualisation has to be loaded (session file or SBML import of network via CySBML). The 'sbml type' node attribute with values 'species' or 'reaction' is necessary for all nodes for CyFluxViz. This attribute is automatically generated if the network is imported as SBML via CySBML. If the 'sbml type' node attribute is not available it has to be generated manually. After loading the network for the flux visualisation the flux distributions for the network have to be loaded. This is managed via Load val. Node attributes for the val files and the necessary edge attributes (edgeval & edgeval_dir) are generated. Flux files (*.val) consist of id -> flux mappings corresponding to the loaded network. The used network and flux files have to be consistent in regard to the node identifiers. The loaded flux distributions are shown in the Flux Distributions Area. To visualise the fluxes select one of the loaded flux files in the table. The information about the selected flux distribution is displayed in the information panel and the flux mapping is updated based on the selected flux distribution. CyFluxViz can visualise the flux containing subnetwork in the full network graph. Only the edges with (flux != 0.0) and the adjacent reaction and species nodes are shown. To limit the view to the flux subnetwork activate flux subnetwork in the Settings Area. Additional mappings of node and edge attributes can be used in the visualisation. These additional mappings are generated in the VisualMapper in the Control panel. So for example the localisation of the metabolic network elements can be mapped to the node color or gene expression values to the node size. 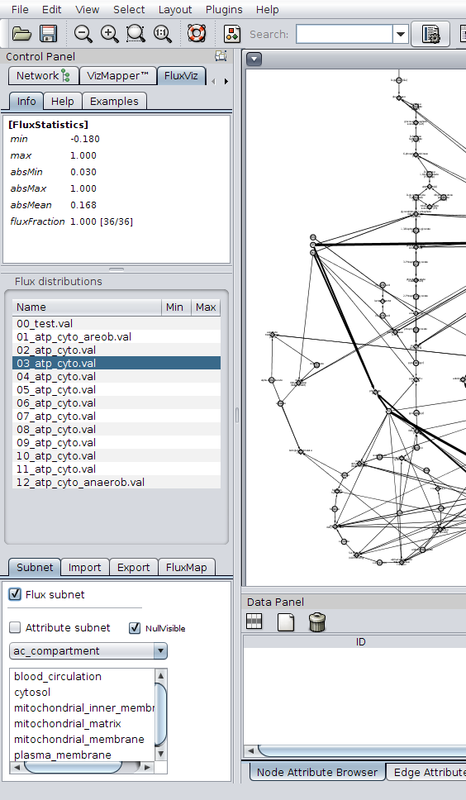 cy2fluxviz: Cytoscape 2 plugin for visualization of flux distributions.